There are many ways to use Tarot cards beyond the well-known process of doing a traditional reading. Here’s a way to create a happier life today using a bit of advice from the Knight of Wands. Does it seem sometimes that we’re always going somewhere instead of being anywhere? Doesn’t it seem like we’re always in a hurry? We live our lives in fits and starts, rushing to complete something, hurrying to get somewhere. Then when we get there (wherever “there” may be) we may stop, relax, and enjoy the moment briefly, but then we dash off again to somewhere else. … It is impossible to stop and smell the flowers when we don’t even see them, especially when we are zooming past them at 60 miles per hour. But we can learn to pay attention to where we are and what is going on around us—flowers or no flowers—even when we are rushing along from here to there. Today, whenever you find yourself running late, take a few deep breaths to relax yourself. Then, without any judgment, focus your attention on where you are and what is happening. Pay attention to your breath and if any worrying thoughts intrude, just notice them, dismiss them, and return to your breath. Worrying about getting there on time will not get you there any faster, and getting stressed will not make your life any better, so take this opportunity to stop and smell the flowers. Many of these suggestions from the cards about how to live a happier, more fulfilled life were inspired by my pithy Tarot meanings and by material in my book, The Soul’s Journey. 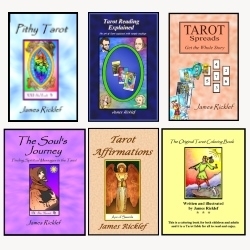 If you like them, you’ll like my books, Pithy Tarot and The Soul’s Journey. Also, for more Tarot messages, LIKE my Tarot Facebook page.